In our travels we are always on the lookout for stops of interest for you, our faithful readers. We’ve brought you information as varied as movie reviews, notes on tegestology (the collection of beer coasters), book reviews, festival news, and interviews with the Beer Snob, the Bar Man, and noted urban sociologist/ author Dr. Ray Oldenburg, the tricky yet informative bar quiz, and some great new music. (That was a not very subtle suggestion to check out our Arts & Leisure section if you haven’t lately). Through it all, we do it with an eye to the best in pub life and culture. Today, we bring you another entry in the increasingly popular world of collecting breweriana—or, to put it in layman’s terms, bar memorabilia. Sam’s Steins (www.samssteins.com) caught our eye as we traveled through Lancaster and the surrounding area. Stopping in one day, I had the good fortune to meet both owner Sam May and his daughter. They are open and friendly and the shop is a charming salute to bar collectibles and, in particular, beer steins. 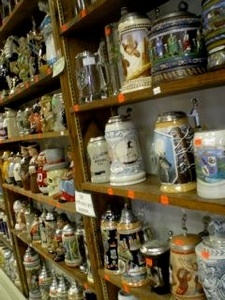 In fact, it’s the largest collection of steins we’ve encountered. Sam opened his shop in the late 1960’s and moved into full time business in the early 1970’s. He anticipated the craze in bar and beer collecting and now does a thriving business, including a mail order service. Sam stocks almost anything you could imagine from signs to flasks to apparel to coasters, but the stars of the shop are undoubtedly the steins. It’s perfectly appropriate that Sam should have opened shop in what was once known as the “Munich of the New World” because of all the quality breweries that once operated in the Lancaster area. It’s a tradition that is enjoying a resurgence. There are some exceptional beers coming out of this neck of the woods, and Sam’s Steins is right in the heart of it. Beer steins have a fascinating history, having come into existence in the 14th century in Germany as a response to the bubonic plague and infestations of flies. Seriously. Laws were passed requiring drinking vessels to have lids for sanitary reasons. Beer steins were the result. Collecting beer steins became popular in the 1800’s and has continued as a pastime ever since. Stein’s also became a widely used means of advertisement, in the U.S. often associated with Anheuser- Busch, but used widely around the world. More information on beer steins can be found at www.steincenter.com . Or better yet, make a stop at Sam’s Steins when you are in the Lancaster area or visit their website from wherever you may be. The quality of customer service is matched only by their impressive collection of breweriana.